Tom Arviso, Jr. majored in journalism at Arizona State University. He became managing editor of the Navajo Times in October 1988, editor and publisher in 1993, and was named CEO of the Navajo Times Publishing Company in 2004. 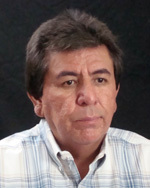 Arviso is a former board vice president and treasurer of the Native American Journalists Association’s Board of Directors, a member of the Arizona Newspapers Association’s Board of Directors and a board member of UNITY – Journalists of Color. He has received numerous awards such as the John Peter and Anna Catherine Zenger Award for Freedom of the Press and the People’s Right to Know, a John S. Knight Fellowship in Journalism in 2000-2001at Stanford University, the Arizona Newspapers Association Freedom of Information Award, and The Native American Journalists Association’s Wassaja Award, for extraordinary service to Native journalism.